As the Jersey Shore swells in population from tourists this summer, something is still missing — the full-time residents it has lost in the past 10 years. While New Jersey increased in population by nearly 3 percent from 2005 to 2014, the average town along the coast experienced a 9 percent decline, a NJ Advance Media review of Census data found. That shift likely reflects major issues in Sandy recovery and the changing economic landscape of Shore towns. In some towns, the losses are particularly stark. Sea Isle City lost 38 percent of its population in the 10 years. Beach Haven lost 36 percent. Larger towns with significant inland populations may not make the top 10, but still suffered significant losses. Toms River, for example, bled nearly 3,800 residents over the last decade, though most of those losses were likely near the Shore. The population in New Jersey has tended to increase in urban areas and decrease in rural areas over the past decade. But a closer review of the areas in Shore counties — Atlantic, Cape May, Monmouth and Ocean — reveals that towns along the coast are losing their residents. Shore residents are experiencing the results of this change. Toms River Mayor Thomas Kelaher said that enrollment in schools there have shrunk from 18,000 students to 16,500. John Ducey, the mayor of Brick, also noted a drop in school population. He attributed the change to vacation homeowners pushing out full-time residents. But he also said Sandy’s traumatic effect was a factor. “People move out because they didn’t want to deal with a second Sandy, or they couldn’t get insurance or FEMA [assistance],” he said. 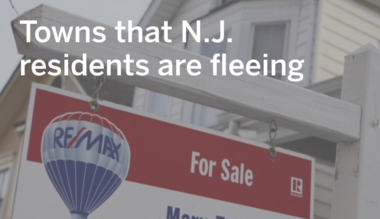 The 10 fastest shrinking towns in N.J. While New Jersey is still growing slowly, one wide swath of the state is not. Sue Marticek, the executive director of the Ocean County Long-Term Recovery Group, said requests they continue to get from desperate homeowners indicate that Sandy has affected the Shore’s population shifts. Only 3,634 of the 7,776 people to receive aid through the state’s Reconstruction, Rehabilitation, Elevation and Mitigation program have begun living in their homes again. With insurance money slow to trickle in, and building costs high, many homeowners have opted to move — if they can afford it. If they can’t, the homes remain vacant. Vacancy rates among the four shore counties — Atlantic, Cape May, Monmouth, and Ocean — are at 2.42 percent as of 2016, compared to the New Jersey average of 1.51 percent, according to RealtyTrack data. Property values in Atlantic and Cape May counties reflect this real estate trend. Atlantic county has experienced a 5.6 percent drop in property values from April 2015 to 2016, according to Zillow research data, and are down 39 percent from their peak in 2006. Cape May property values have dropped 21.8 percent since their peak in 2006. The shore population has been declining since at least the 2000 Census. Kelaher said this is partially the result of young adults and families moving into more metropolitan areas and away from the relatively quiet environment of the year-round shore. Additionally, economic problems could be leading residents to look for homes elsewhere. In Atlantic City, where casino closings and lowered revenue have led government officials to consider bankruptcy, property values have dropped 9 percent in the past year. It’s also experienced a slight drop in population — slightly less than half of a percent since 2005. If the population trend continues, it could lead to further economic problems. Marticek said residents renovating or selling their houses could spend less money in the shore towns, driving down revenue the towns need for infrastructure. “Even if you never had a drop of water enter your home in Sandy, you could still be affected by the economic problems of the town around you,” she said.